With John Cooper Clarke, Attila the Stockbroker and Ian McMillan! 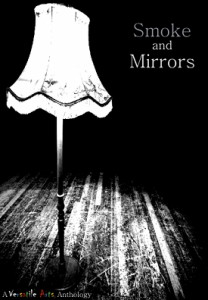 The Smoke and Mirrors anthology features 27 poets and includes a CD with over 30 tracks. Versatile Arts are a Malvern based creative collective who have promoted and produced many events. They decided to publish a poetry anthology to capture and celebrate the current exciting and expanding poetry scene in Malvern. The book includes poetry from Attila the Stockbroker, John Cooper Clarke, Ian McMillan, Amy Rainbow, Gary Longden, Emma Purshouse, Bill Thomas, Dan Duke, Shani Stocker, Tim Cranmore, Ali Oxtoby, Ted Underwood, Peter Wyton, Ray Miller, Guy Martyr, Trish Marsh, Sue Thompson, Brenda Read Brown, Heather Wastie, Fergus McGonigal, Laura Dedicoat, Simone Mansell Broome, Lydia Davies, Catherine Crosswell, Myfanwy Fox, Ronnie Salisbury and Adrian Mealing. The Smoke and Mirrors anthology and CD can also be bought from The Great Malvern Hotel, Graham Road, Malvern or Aspect Design in Newtown Road, Malvern.